My Betta was Trapped! <Hello! Ryan with you> I have a small 2.5 gallon aquarium in my office. 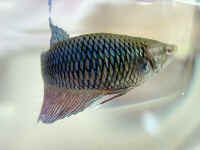 I have one male Beta. I noticed this morning that he looked trapped in a hole in some coral that I used for a tank decoration. I reached in and took the coral out but unfortunately most of his fins are gone, especially the one's underneath. <Bettas are delicate! In the future make sure to keep them with things they can't rip themselves on.> He had, he seems very listless and I don't know what to do. The tank is fine, the water levels are good, and I just don't want to loose him. 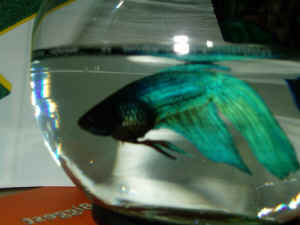 <I understand.> I don't know if I should switch him to a small bowl or leave him, he is the only fish in the tank. <Try a touch of stress coat, or something similar. Just give him time, make sure he eats to keep up overall health. Leave him where he is-he doesn't need anymore stress.> I would appreciate any help. Thank you, Lori <You're welcome. Ryan> I have enclosed a couple of pictures if that will help. Follow-up to: I THINK MY BETTA IS DYING... Hello Bob, <Hi Ron> I want to thank you again for your quick, kind, and good advice a couple of weeks ago (please see our previous communications below). I'd like to update you on my Betta's condition. He is still alive, but not very energetic, until I drop some food in his tank, and then he goes right for it. 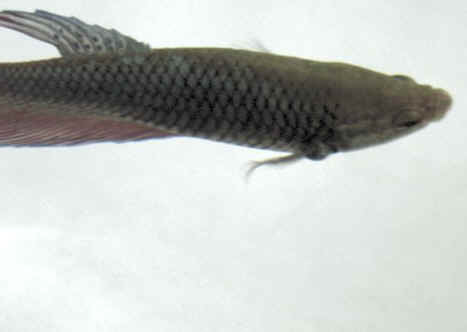 However, he spends most of his time lying on his side and floating, unable to submerge unless he swims really hard and jams himself under the leaf of a plant to keep from surfacing. I have been feeding him bloodworms and Betta bites. I have changed his water and made sure to add salt and stress coat, and have tried to keep his water temperature in the low 80's. Also, at the suggestion of one of the people on your web forum, I treated his water with the anti-biotic Maracyn 2 for 5 days, and then changed his water. He does not seem bloated, so I can't understand why he is so buoyant. 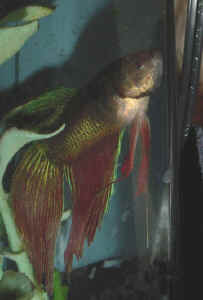 Is he just dying slowly and I have to just accept it, or is there perhaps something else I can do to restore his equilibrium/neutral buoyancy and/or his energy? Again, thank you very much. <Let's try adding some Epsom Salt to your Betta's water. Just about as much as will cover a quarter per quart. This "cathartic" may help "move" your fish to health. Otherwise, all you list, the food improvements, elevated temperature, antibiotic use... is what I would have done. 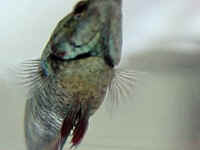 Bob Fenner> Sincerely, Ron M.
Re: I THINK MY BETTA IS DYING... Thank you very much for your quick reply and good advice. I will follow your suggestions. Happy Holidays. <Good luck, life to you my friend. Bob Fenner> Sincerely, Ron M.